PT PP Properti Tbk - PP Properti is a rapid growing public-listed property company in Indonesia. 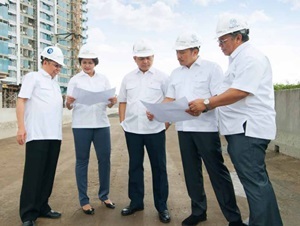 PP Properti operates primarily as a property developer with strong business competencies in three business pillars: Commercial, Residential and Hospitality. Its business include development, construction and management of several commercial building, office, apartment, residence, hotel, mall, trade centre and other facilities. PT PP Properti Tbk is a directly-owned subsidiary company of PT PP (Persero) Tbk (PTPP Group), a reputable state-owned construction company in Indonesia. PT PP Properti Tbk was formed on 12 December 2013 as spin off results of Property Division of PTPP Group. In 20015, the Company went public and its shares are listed on the Indonesia Stock Exchange (IDX) under reference code PPRO. As of December 2016, PT PP Properti Tbk is 64.98% owned by PTPP Group, 0.06% by YKKPP, and 34.96% by public. Based in Jakarta, PP Properti now has 1 subsidiary company, namely PT Gitanusa Sarana Niaga (99.99%). In the business year of 2016, PP Properti recorded a satisfactory performance growth. According to PT PP Properti Tbk Annual Report 2016 as cited by JobsCDC.com, PP Properti reported total operating revenue of Rp 2.1 trillion in 2016, an increase of 42.86% from Rp 1.5 trillion in 2015. Total current comprehensive profit in 2016 reached Rp 365.4 billion, increasing 21.67% compared to Rp 106.12 billion in 2014. Minimum educational background in Bachelor Degree (S1) from a leading University, majoring in Electrical Engineering, min. GPA 3.00 out of 4.00. Required experience for minimum 1 year in the same field. Age between 23-27 years old. Operating knowledge of Ms. Office. Advanced knowledge of maintenance procedures M / E, hydraulic and pnematik. A solid understanding about the PLC system. Able to communicate in English actively or passively. Minimum educational background in Bachelor Degree (S1) from a leading University, majoring in Accounting, min. GPA 3.00 out of 4.00. Operating knowledge of Ms. Office and Accounting Program. A solid understanding about the financial statements (cashflow, balance sheet, and tax). Minimum educational background in Diploma Degree (D3) from a leading University, majoring in Taxation, min. GPA 3.00 out of 4.00. Minimum educational background in Bachelor Degree (S1) from a leading University, majoring in Civil Engineering, min. GPA 3.00 out of 4.00. Required experience for minimum 1 year in the same field. Fresh Graduate are welcome to apply. Have strong competencies at management control, attention to detail, seeking information, teamwork and coordination. Minimum educational background in Bachelor Degree (S1) from a leading University, majoring in Healthy and Safety, min. GPA 3.00 out of 4.00. Required experience for minimum 2 years in SHE/HSE role including responsibilities for provide coaching on site, planned and unplanned. Possess certification in Ahli Muda, AK3 Konstruksi. Hands-on experience in OHSAS 18001 or ISO 14001 International Standards. Age between 24-30 years old. Strong knowledge regarding health, safety and environmental regulations / law. Have good presentation skills (with or without power point). Minimum educational background in Bachelor Degree (S1) from a leading University, majoring in Law, min. GPA 3.00 out of 4.00. Following the developments on legal property. JobsCDC.com now available on android device. Download now on Google Play here. Please be aware of recruitment fraud. The entire stage of this selection process is free of charge. PT PP Properti Tbk - D3, S1 Fresh Graduate, Experienced Officer, Engineer PTPP Group January 2018 will never ask for fees or upfront payments for any purposes during the recruitment process such as transportation and accommodation.